This is my fourth issue as Poetry Editor at IQ. It’s been such a delight assembling the voices for each recital, aiming for depth and range across a small stage, a given number of pages that host the poetry within the larger ambit of the magazine. What may have initially seemed like a constraint has really been a wonderful way of homing in on what I want each issue to do, or rather, be. Looking back at my first issue (July-September 2017) I see Mona Zote’s powerful ‘Boat Building’ and Anitha Thampi’s ‘Alappuzha Vellam’ (powerfully rendered into English by J Devika) as book-ending a set of reflections on language as an elemental thing. By choosing ‘jalam’ over ‘vellam’ the poet accesses, more than meaning, an entire terrain, an ecology that rises and stains and persists. Prefacing the precise choices made by poets (and indeed, their translators) is an entire archive of childhood memory, accessed by an adulthood where doubt persists, and “the throat stays parched”. As the Estonian poet Doris Kareva’s translator Miriam McIlfatrick-Ksenofontov writes in her prefatory note to Doris’s ‘Days of Grace’: “the whole momentum of a poem seems to depend solely on the physicality of the words”. Between “striving for concord between that which seeks expression through language and language which does not allow it to be expressed” is the dangerous act of writing, the possibility of sinking, being swamped. Aditi Angiras’s desire to be mangrove-like—“feet in the mud/ hands in the skies”—is as heart-breaking as her longing to make gravity occur wherever her feet are placed. Between “blood in your mouth” and “head in the air” is the felt peril of testing concepts against the very words that explain them. In K Srilata’s poems, the earth is a landmine, there is no shore, and everything ebbs away. The urgency of her italicised lines express both warning (in ‘One False Step’) and wish (in ‘The Cruelty of Small Things’). Mona Zote’s boat-builder “wants to make sure everyone is safe/ Because the water’s rising”; he needs to get away, or perhaps simply get a few essential things (“a shipment of warm sweatshirts … a good politician or two”). The poet’s response to this desperation is to pay close, hard attention to her immediate surroundings, and what she sees is a temporary shoring against what Srilata calls the “detritus of despair”. Concomitant with the celebratory certainty of blue hills, consistent clouds, beautiful women and strong men is another, more desolate one: “Boat building is a child’s endeavour”. Between the building of the ark in the face of the flood, and the flood itself, these poems, I now see—with even greater clarity than when I assembled them—carry the freight of a longing larger than survival, a return to words that might hold fast, might prove less treacherous than mud, more robust than the sound of a hammer “soaring clear above all else”. 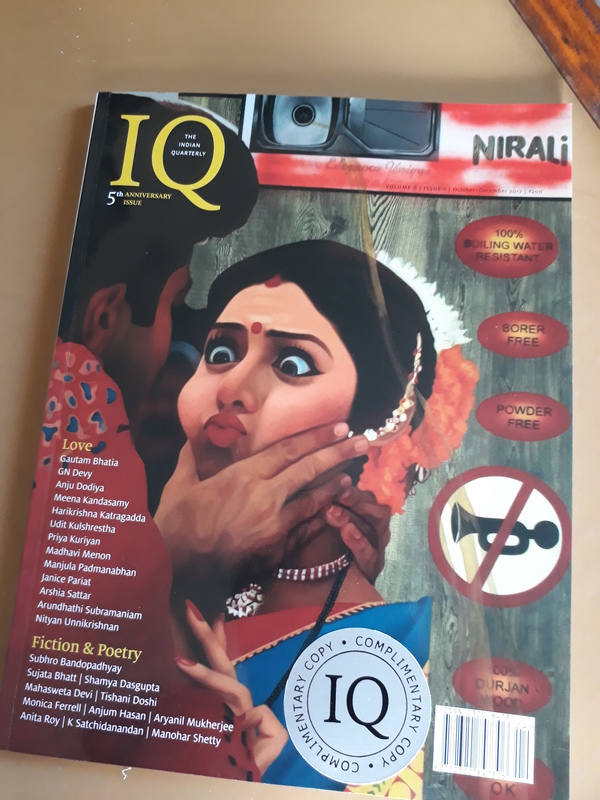 My next issue (October-December 2017) was a very special one: the 5th Anniversary issue of IQ, dedicated to Love in its many guises. I wrote about it (in a rare moment of afterglow) here. The new year brought in not just new poetry and translations, but also a new look to my precious poetry pages, with a recalibration of visual details that the very talented art director at IQ, Rahul Das, has been working on, right up to the current issue. The theme for January-March 2018 was Home, and when I reached out to two very special poets, Karthika Naïr and Tsering Wangmo Dhompa, they offered me brand new work for the issue. Karthika’s ‘Line 7: Homistan’ is a fantastic immersion in the judder and jolt of the Paris Metro, where “boundless … enquiry” and “chromatic cusses” sit alongside a sharp critique—in two languages, English and Malayalam—of the powers that “decree what I can eat”. It is a celebration of the “ripples of tongues” that “suffuse the amber-tinted air”. It is a joyous testament to that fractious question of “where and why I belong”. Accompanied by the young Gond artist Roshni Vyam’s art, it is complex, formal, sumptuous and cerebral all at once. In a class meant for poetry, for poets we look for a third option, not antonyms, not synonyms, something that skips the preface before 1959 and after 1959 the way the elders do as they wait to return home. I’ve promised myself I will not write about exile, or about home, but everything shifts from their positions, except my hope. This was also the issue in which the celebrated poet and translator Marilyn Hacker featured in both her avatars, making it doubly special for me and for Samira Negrouche, who suggested the idea—this is one of those rare occasions when poet, translator and poet-as-translator sit together. Marilyn’s ‘Calligraphies V’ is a model of elegance, a sequence of tanka-like compositions that bears witness, with wry factuality, to the “Liminal space where/ exiles with dictionaries/ lose themselves”. Marilyn asks us to consider “Words// with different valences in/ subliminal translation”; and wonders how we read a world in which the question is “Are you immigrants/ or political exiles/ or refugees?” There is the asking, and then there is the arrival. When you turn to Marilyn’s translations (from the French) of Samira Negrouche’s poems ‘Halt I’ and ‘Halt II’ the connective tissue springs clear in the most delicate way. In her translator’s note, Marilyn writes, “The sense of place is a strong component in Samira Negrouche’s poetry. The ‘place’ is most often Algeria, and the landscape Algerian … This sequence, albeit rooted in a landscape, is more abstract than some of Samira Negrouche’s poems: the challenge is to evoke with sonorities what is not specified with detailed descriptions or names”. It is this evocation of sonorities that rings through in Rahul Soni’s translations of Hindi poet Udayan Vajpeyi’s ‘She’. It was lovely to work with the poet and the translator in fine-tuning this version. The mystery of a person brought back to life in words unfolds against a galactic canvas where the universe expands and contracts to make room for earthly longings. We are implicated in the “joke” that is the universe, we are bound in its sticky web, we negotiate the difficult places between non-being and possible-being. From the minutely-observed moment to the grandly-staged eternity, the poets in this issue spoke to and of home in many different ways. 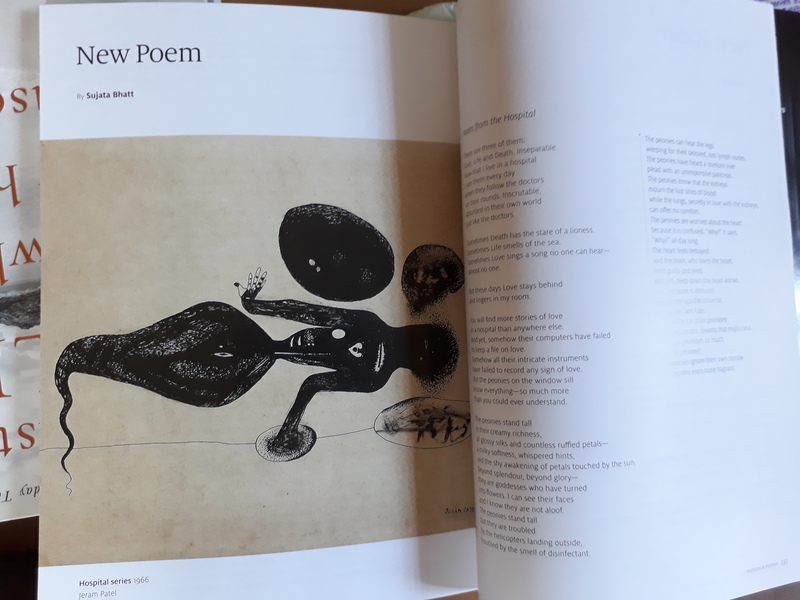 The latest issue (April-June 2017, now on the stands) opens with a suite of five poems by Imtiaz Dharker from her latest book Luck is the Hook (Bloodaxe 2018), accompanied by a beautiful artwork by the poet, titled ‘The Haunting’. Imtiaz’s seemingly effortless compositions are lambent with longing for the departed; leavened with wisdom and grace. To read them is to be moved, and haunted, and consoled. While Anindita Sengupta’s poems—‘Hollow’, ‘Riven’ and ‘Safety Instructions’—speak of deception, and vulnerability, wondering about the spaces we contain and are contained by. She is a quiet, keen observer, and in her quiet, keen words we sense the natural world’s mysteries as apprehensible, but “not teachable”. Hers is the longing to believe, to understand, to know. And sometimes, to let it go. Revisiting my selections I see other connections—ghosts and ghazals, stone and prayer. Perhaps these are the ways in which poems speak to each other as much as they do to the reader. I will conclude this post by saying that having Ranjit Hoskote’s excellent translations of Ghalib’s ghazals for this issue has been a very special pleasure. I had seen early versions of these translations way back in 2006 and am delighted that IQ has been the first to publish them in 2018. Get a glimpse of Ranjit’s Ghalib—this “bohemian maverick”, this “celebrant of the sensuous”—right here on the website, and pick up the issue for the entire feast. Read them aloud to savour lines like, “Fool heart, what’s wrong?” And then re-read them for the emotional and intellectual charge they carry, incandescent and enduring. The words that give this post its title are from Sujata Bhatt‘s ‘Notes from the Hospital’, which she was good enough to send me when I asked her for an unpublished love poem for the fifth-anniversary issue of The Indian Quarterly. The poetry section in IQ has not traditionally been linked to the theme driving the issue, but this time I thought it might be worth doing that, in subtle, tangential ways, as part of a celebration not just of the magazine, but of love itself. Sujata’s poem gave me the perfect lead for my precious ten pages, complemented by Jeram Patel’s art. Additional delight in the fact that MPT also chose three of my translations of the young Hindi poet Monika Kumar, whom I first met at a translation workshop organized by Literature Across Frontiers in Chandigarh in November 2016. Hearing her read her poems in the original (and seeing how beautifully they travelled into languages such as Slovenian, Galician and Maltese) made me want to work in collaboration with her on fresh new English versions, one of which you can read here. And because good things come in threes, so happy that the Malayalam poet Anitha Thampi’s poem ‘Allapuzha Vellam‘ (fabulously translated by J Devika), which I featured in my debut issue as Poetry Editor of the Indian Quarterly (IQ), found a place in this special issue of MPT, the two journals joint-publishing it for the first time, almost-simultaneously in India and the UK. 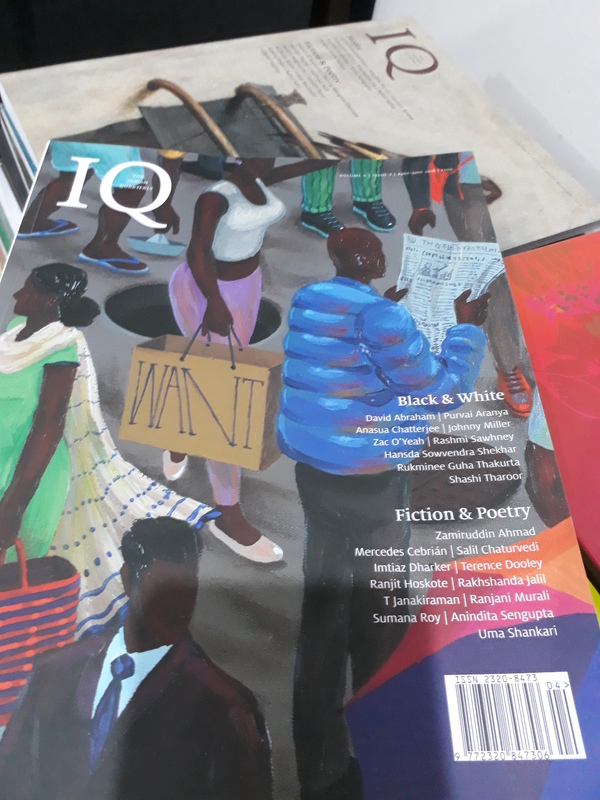 IQ is one of the few print magazines that makes room for poetry, and it’s been a real pleasure curating my pages. Apart from Anitha, who is based in Thiruvananthapuram, I featured the Estonian poet, Doris Kareva translated by Miriam McIlfatrick-Ksenofontov; and new poems in English by Mona Zote (Aizawl), K. Srilata (Chennai), Aditi Angiras (Delhi). And at Chief Editor Madhu Jain’s invitation, I also wrote a small feature investigating what is being described as a “poetry resurgence” in India. Happy reading! I sometimes wonder what it is about Wales that draws me like a magnet, ever since I first encountered its language and its people way back in 2009. I can’t speak Welsh, but, as I found myself saying at a reading in Machynlleth earlier this month, I feel Welsh. What does that mean, I wonder, now that I’m back home, in Maharashtra, where the last of the monsoon greeted me like a long-lost friend, and the heat and humidity hit me like a forgotten nightmare. To feel like a people, like a language, I must speak not Welsh but Cymraeg, I must learn to get my tongue around those unpronounceable lls. Mustn’t I? I don’t, I can’t. And yet the connections are real, long-lasting, based on more than language; formed despite initial incomprehensions about why I, a Bengali, could choose to write in English; sustained through conversations over time, across seemingly impassable distances. Perhaps “feeling Welsh” is simply my shorthand for saying I love the country, love its gentle people, its spectacular landscapes, its intimate scale and most of all – its poets. Thank you, good people of Literature Across Frontiers for imagining and enabling this project, for the inspired pairings, for the sheer gumption of seeing us through difficult times, sometimes on little more than a poem and a prayer! Thanks also to the British Council and Wales Arts International for their continued support, and to Aberystwyth University for giving me the pleasure of being one of their Creative Associates. PS: A friend gave me a packet of Welsh Brew before I left. Reading the label back home I noticed it said that this original blend is “a fusion of the finest African & Indian teas”. As an Indian born in Africa (and brought up in Darjeeling, home of the finest Indian teas), the connection was as immediate as it was irrational – this was it then, the symbol of that inexplicable feeling: feeling Welsh. Here it was, my cup of tea.